“If I had to choose for my grandchild to be born with any type of difference, I would hands down choose a cleft lip and palate.” - As said by my OB when he told me about my son’s cleft after the 20 week ultrasound. In February 2009 I went excitedly to my OB’s office, 6 year old daughter and hubby in tow so we could see our baby! We were most excited to find out the gender, all bets were on a baby boy. Little did I know that day would go from excitement and joy to sadness and fear. If you’re here, you likely know what I’m talking about. It’s that day you found out your child would be born with a cleft lip, a cleft palate or both. I remember that moment, it was a scary one. All I could see in my head was the photos of babies from some far off country who had eyes begging for your help. At that moment, I’m sure my eyes turned the same…begging for someone to tell me that it was going to be ok. At that time, it was my husband. He was always there, a port in this storm I could not fix. But what I wanted, what I really wanted was another mom to talk to. 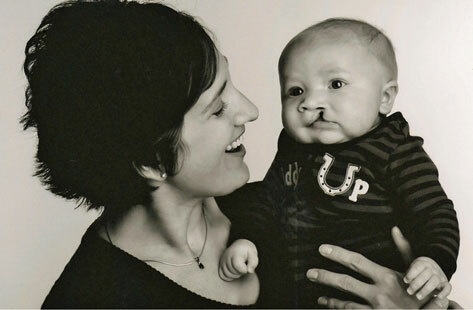 When I met other moms of babies born with a cleft is when my outlook changed. Hope and optimism replaced my sadness and fear. This is why I’m here now, to be a support to parents and their families facing this unexpected journey..